Deputy FM Hotovely tells foreign ambassadors that fighting Hamas, Iran, is the only way to help Gazans. 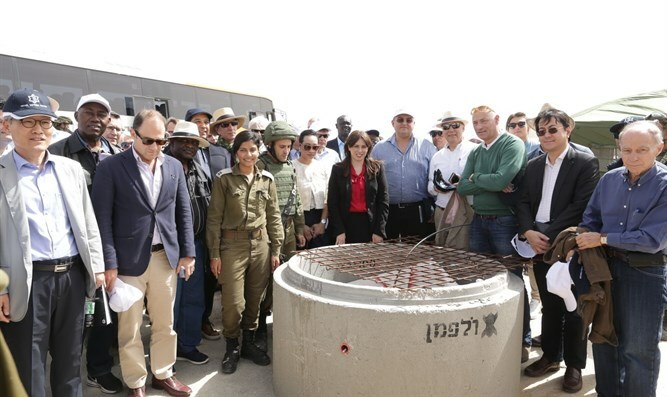 Deputy Foreign Minister Tzipi Hotovely (Likud) on Monday spoke with with foreign ambassadors to Israel about the Hamas terror tunnels recently destroyed by the IDF. Speaking to the ambassadors, Hotovely said, "The tunnel destroyed by the IDF last week...led to the town of Kerem Shalom, where we visited two weeks ago. Hamas has thrown Gaza residents to the wind, and is using [humanitarian] funds to carry out terror attacks against Israeli citizens." "It's important to remember that behind each of Hamas' actions is Iran. The Iranian regime transfers $100 million annually to Hamas, and every cent of it is used against Israel. It does not help Gaza residents at all. "We cannot support Hamas' provocations. The only purpose their violent marches have is to undermine Israel's sovereignty, and they should not receive international support. We cannot help Gaza residents without fighting Hamas and Iran." Head of International Media at the IDF Spokesperson's Office, Lieutenant Colonel Jonathan Conricus explained to the ambassadors how events had unfolded from a security standpoint, and how the IDF had prepared for the Gazans' planned march, funded by Hamas, towards the Israeli border. "Hamas understands that the IDF is destroying the terror tunnels, and they are using Gazan residents in order to escalate the conflict with the IDF," he said. "We will not allow any harm to befall Israel's security infrastructure or IDF soldiers."